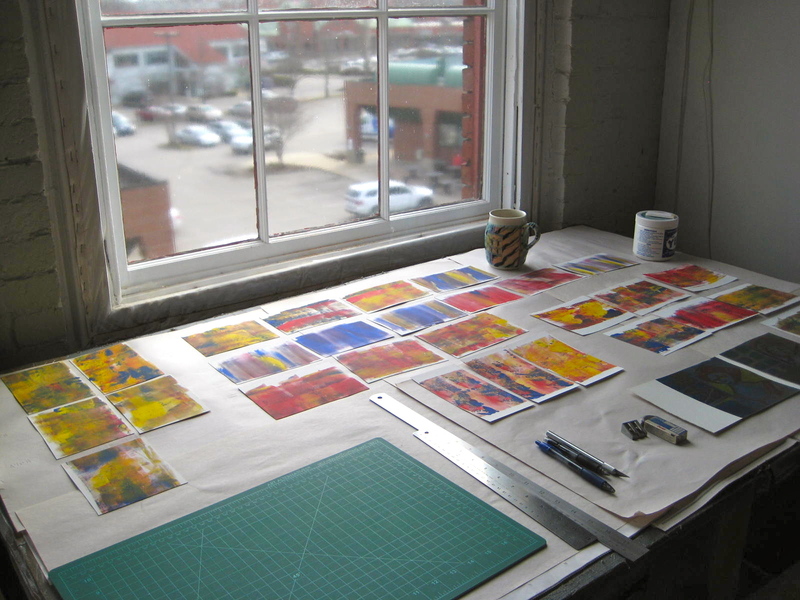 This week I worked in my friend Darlene’s third-floor corner Button Factory studio, trimming a bunch of little abstract monotypes which I had printed last November. An experiment: nine little monotypes on one full sheet of paper. I came upon these printed sheets and started trimming them while thinking about various ways I might be able to combine my monotypes with hand bookbinding. This past week I finalized plans with Lynn Crocker to begin working on hand bookbinding projects on a regular basis in her second-floor studio in The Button Factory. I completed Lynne’s Hand Bookbinding workshop last September. Now I want to get into a rhythm of hand bookbinding. For me, working alongside Lynne in her studio seems the best way to refresh, maintain and surely strengthen my hand bookbinding skills. Meanwhile I now have a stack of small trimmed monotypes awaiting some next step. I don’t know what I’m doing nor where this monotype + hand bookbinding combo will take me. It occurred to me, while I was trimming and thinking and trimming and thinking these past couple of days: the only way to create something totally new actually is to have no idea what you’re doing. Case in point, Henri Mattisse and his cut-outs.